My thesis data-collecting semester is all but calm, and I haven’t been able to sit down and really write a post in a couple of weeks (although I have a few in the making). Because of this I’ve decided to recycle some of my old posts that were published at the birth of this blog, which means they were probably never read. This post is from my first semester of grad school last fall when I was just beginning to learn about the complexities of science communication. I began making visuals to help me learn and this was one of the first! Enjoy! If you’re a follower of science, health or communication-related topics, please follow along and comment! Since most people probably don’t have the time to read long journal articles, I’ll just summarize the key points and make them into illustrations. 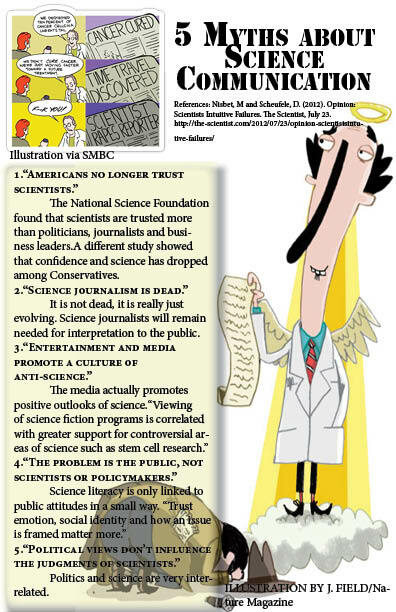 Here is the first one, the “5 myths of Science Communication,” from an opinion article titled “Scientists Intuitive Failures,” from The Scientist. ← What exactly is pus? Find out in 15 seconds. I think you misrepresent the media in your third point. Science fiction viewership makes up a fraction of TV viewership, so I don’t think it’s fair to imply that the media promotes science if only a small fraction of TV shows are correlated with increased support of science. Other than that, I think you present important science communication issues where popular opinion does not align with evidence.